M Indira Gandhi (right) with Hindu Sangam president RS Mohan (second from right) and Indira Gandhi Action Team group leader Arun Dorasamy (extreme left) at the press conference. 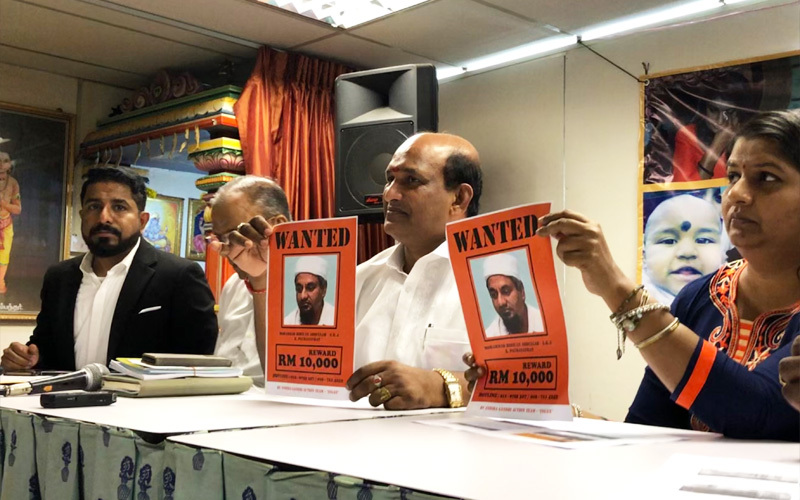 PETALING JAYA: A group set up by civil society members to help kindergarten teacher M Indira Gandhi look for her long-missing daughter is offering the public a RM10,000 reward to track down her former husband, Muhammad Riduan Abdullah. 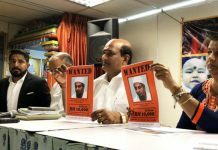 The group, calling itself Indira Gandhi Action Team (Ingat), said it wanted the public to come forward and provide relevant information on Riduan and Indira’s youngest child, Prasana Diksa, who went missing 10 years ago. Speaking at a press conference today, Indira said although she had won her long legal battle in the courts, she could not get Prasana back. “My worst fear as a mother is I don’t know if she is alive today. “The Ingat team had checked with the education ministry’s database but we cannot find her name being registered in any school. “Where is she now if she is not schooling?” the emotional Indira asked. Indira also said there were allegations that Prasana may be abused. “If these rumours are true, I am sad that I’m not there to help her get through this tough time. My hope to hold her again is becoming a challenge,” she added. The Federal Court had in April 2016 ordered the inspector-general of police (IGP) to arrest Riduan for contempt after he failed to obey the court order to surrender Prasana to Indira. Prasana was one year old in 2009 when Riduan snatched her from Indira. Indira had also won her challenge to nullify her three children’s conversion to Islam by Riduan, formerly known as K Pathmanathan. Police said they had been tracking down Riduan since 2014 and urged the public to come forward and provide information related to Riduan. Meanwhile, Ingat‘s leader, Arun Dorasamy, said Indira and the group lodged a report with the Malaysian Anti-Corruption Commission (MACC) yesterday against a former senior minister for alleged abuse of power. They urged the MACC to probe the former minister for alleged abuse on claims that he ordered the National Registration Department (NRD) to issue another MyKid card for Prasana. Arun also said the Ingat legal team is also planning to file an application to compel the IGP to look for Prasana. He added Indira had in 2014 filed a similar application to compel then IGP Khalid Abu Bakar to locate and return Prasana to her but the application was dismissed by the Federal Court. “Who can we turn to besides the police, to find her so that this girl can be reunited with Indira?” Arun asked. He said police should have formed a task force to look for Riduan.